A study guide on Christian marriage that focusses on how the gospel shapes the practical realities of everyday life. Most of what the Bible has to say about marriage does not come flagged up under a heading of “marriage”. It’s not just the famous “marriage passages” that should shape a marriage, but the whole Bible-story of God’s good creation, humanity’s wicked rebellion and God’s gracious redemption. To understand why marriages struggle—as they all do—we need to understand the nature of our sin. To make marriages work, we need to understand how to apply the truth about God and his salvation. This study guide on Christian marriage focuses on how the gospel shapes the practical realities of everyday life. Author Tim Chester lifts the lid on many of the common pressure points that modern couples face, and shows how a proper understanding of the gospel can shape a response. Tim Chester advises us in clear, captivating terms what happens when the cross is lifted high in Christian marriage. His advice is uberbiblical and intensely practical. Many couples (especially those who read it together) will find this book to be a life-giving "page turner." Highly recommended. 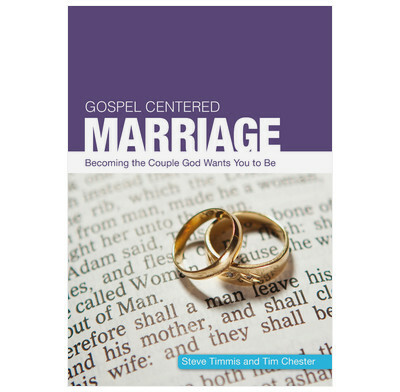 Tim Chester doesn't let us think just theoretically about marriage; his focus is relentlessly practical. He is not afraid to raise issues that couples in all seasons of marriage will recognize as challenging and crucial. This book will help Christian spouses ask real-life questions about God's gospel purposes in marriage, pointing them to search for answers in God's Word. I have just begun to purchase books through "good book" and I have been very impressed with the quality of the books themselves and the speed with which they have been shipped and reached us. My husband and I are reading though it together and have found it really encouraging makes us look at Gods bigger picture rather than just the day to day of marriage. This is such a helpful book! I can recommend it to anyone preparing for marriage. It's been helping us so much! A great little book, studies are well structured and lead to good discussions. I have been doing them with my fiance preparation for our upcoming marriage. You can easily do them in 20 to 30 minutes. This is a wonderful guide to all those out there that wish to follow God's wishes with marriage in mind. There is a little work apart from just 'reading a book' with reference's to look at in The Great Book. My fiance and I have found this an enormous help. Recommended!